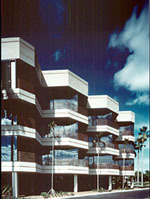 Home of Siemens Corporation, these twin six-story buildings have a central sculpture court and matching fountains. 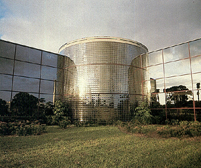 The buildings' facades consist of Persian cream stone aggregate and blue/green reflective glass. While serving as architects, Barretta & Associates also assisted Siemens in its move to Sabre Centre as space planners and interior designers. 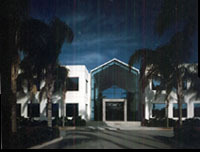 Corporate headquarters of Schmidt, Raines, Trieste, Dickenson, Adams & Company is noted for its high impact entry with marble walls, polished stainless lettering and a cove ceiling that both lights and defines the waiting area. 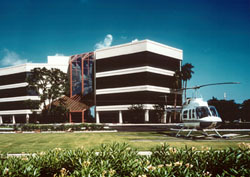 Barretta provided architectural, interior design and construction management services. 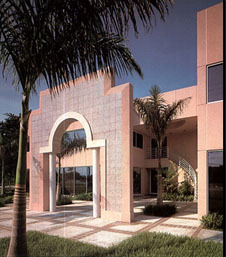 Project: Give Triple Crown Electronics' U.S. headquarters and manufacturing facility a strong South Florida presence. Solution: Barretta & Associates utilized architectural symbolism to subtly define function and create a design statement with high visual impact from adjacent Interstate 95. 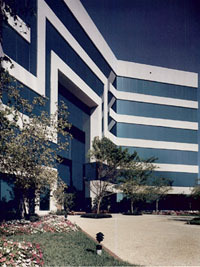 Prestigious corporate office space is provided within a two-story, cylindrical glass block element, nestled in a niche carved into one of the structure's rectangular corners.